How much would you be willing to pay for a home? How about $150 million dollars? That’s what Candy Spelling, the wife of the late television impresario Aaron Spelling, is asking for her 56,500 square-foot, English-style home simply known as The Manor. 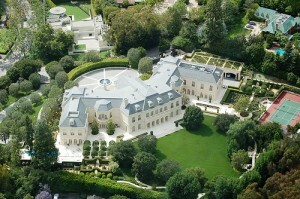 The sprawling Southern California estate recently topped Forbes Magazine’s list of the most expensive homes in America. As you would expect, The Manor has some features that most homes on the market lack, such as a bowling alley, wine cellars and a room dedicated to gift wrapping. The 4.6 acre complex also has parking for 100 cars. However, even though that’s the asking price, the true value is set by the market, and the fact that The Manor has been listed as “for sale” since 2008 shows that perhaps even a house this opulent might not be worth $150 million. A new estate making the list of most expensive homes this year is in Honolulu, Hawaii. The Kaiser Estate is the former home of American industrialist Henry Kaiser and was put up for sale last year for a price of $80 million. The estate is actually three different parcels of land that together make up 5.5 acres. Along with stunning views of Oahu, the Kaiser Estate features a 15,000-square-foot home and 12,000-square-foot boathouse and marina.